While I don’t pride myself on being the first person to have stumbled upon these ideas, I thought I would share my excitement when this mornings Globe’s Lifestyle section provided some noteworthy content for the NAN blog. The Let’s Colour Project is “a worldwide initiative to transform grey spaces with colourful paint”. Working upon similar ideas to Toronto’s own Leona Drive Project, Let’s Colour will work internationally in communities as when “grey is out. gloom is gone”. 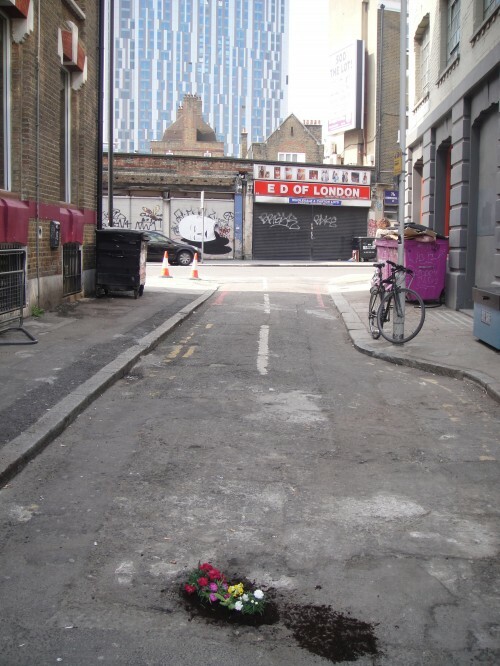 Check out The Pothole Gardener, a graduate student project from the U.K. engaging with civic concerns (dangerous potholes that dislaunch bike tires and ruin cars) through art. This entry was posted in News and tagged Let's Colour Project, random acts of art, street art, the Pothole Gardener by Neighbourhood Arts Network. Bookmark the permalink.